Misssfaith (or better Mrsssfaith since 2013) is who? When I started this blog I was thirty-something (it ended last year). I absolutely love Yoga, music and books. My husband is libyan and I’m german – this binational marriage is wonderful as you learn so much about the other culture and black-white thinking isn’t possible. We have a little son since April 2016 so the mommy life is a new wonderful challenge and surely I will have lots to write about as well. 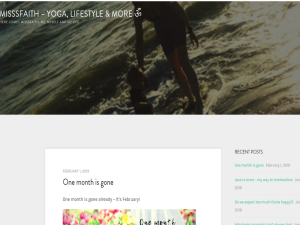 This what your MISSSFAITH YOGA, LIFESTYLE & MORE Blog Ad will look like to visitors! Of course you will want to use keywords and ad targeting to get the most out of your ad campaign! So purchase an ad space today before there all gone! Yoga is so much more than rolling out the mat The post Yoga is so much more appeared first on Misssfaith - Yoga, Lifestyle & more ॐ. We are getting closer to the renewal time of spring. How lovely is alone this thought. The post One month is gone appeared first on Misssfaith - Yoga, Lifestyle & more ॐ. Do we expect too much (to be happy)? If you are the owner of MISSSFAITH YOGA, LIFESTYLE & MORE, or someone who enjoys this blog why not upgrade it to a Featured Listing or Permanent Listing?